Edinburgh castle, above. 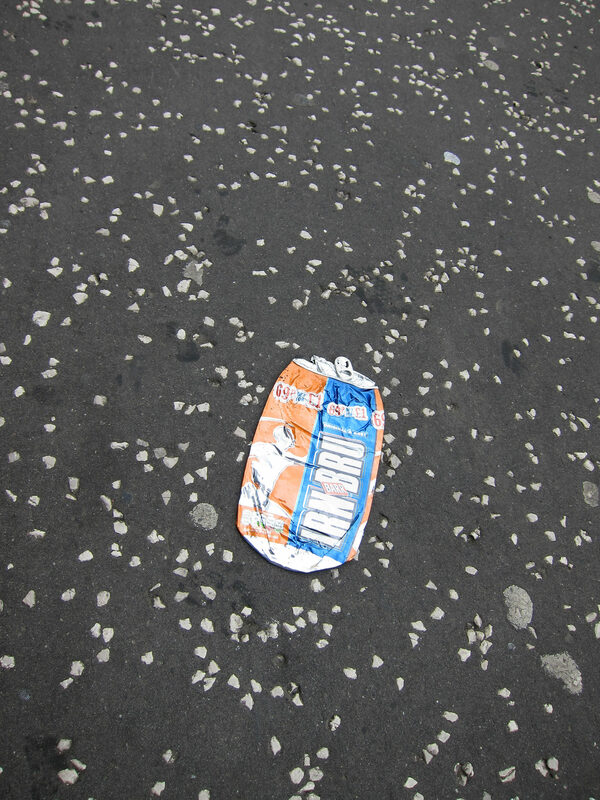 This is the final post in a series of photo-based blogs about dandy Tammy's trip to Scotland. 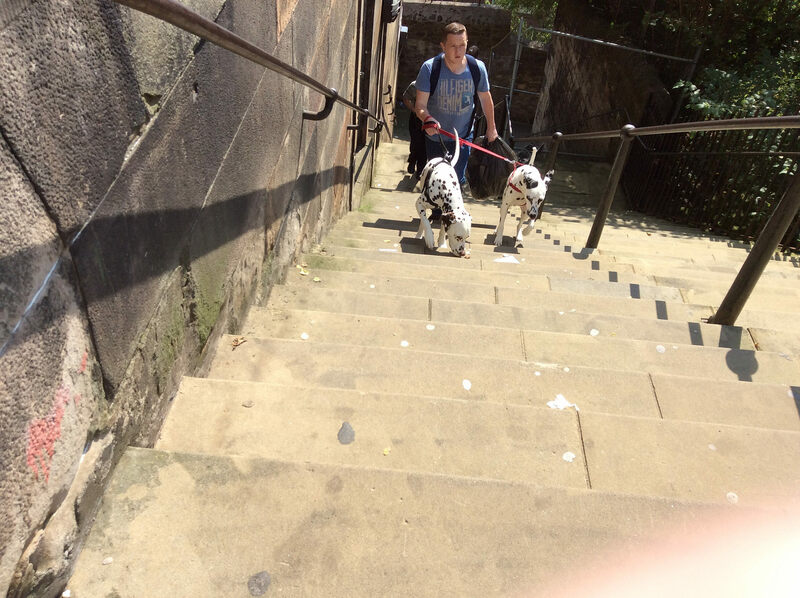 WARNING for regular dandyhorse readers: This post is actually about WALKING. 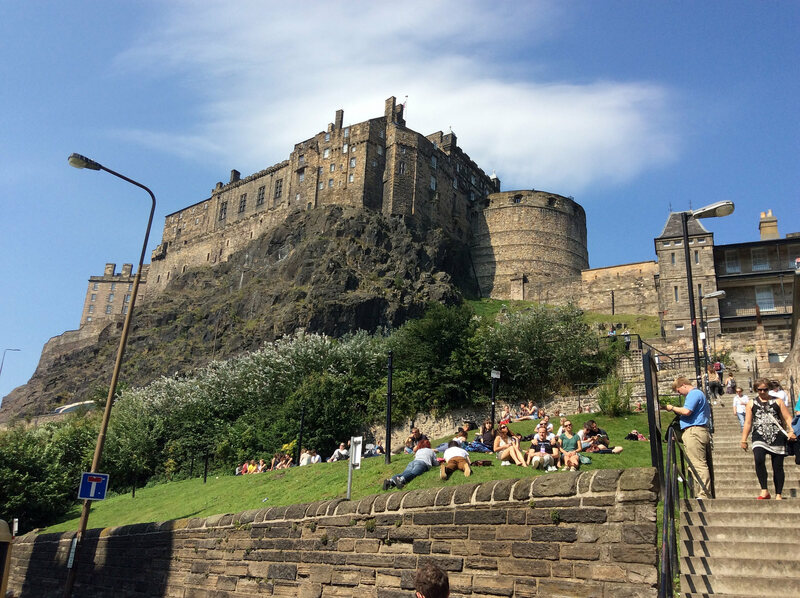 While in Scotland, I spent time in both major cities. 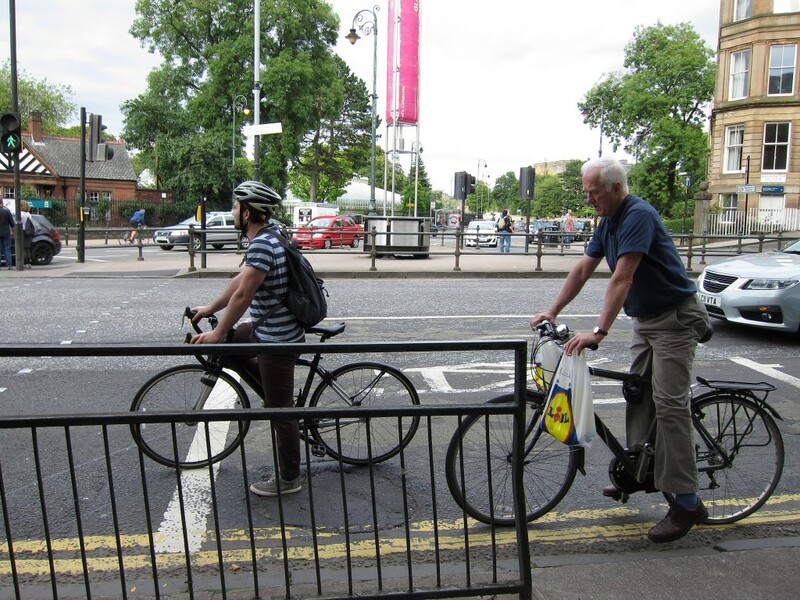 Although there was evidence of great cycling culture in both Glasgow and Edinburgh, no matter where you go, Scots love their wee walks. So I explored the cities like a true local, on my feet. Note: for us North Americans, a wee walk is a five minute shuffle to the bus stop or the corner store. 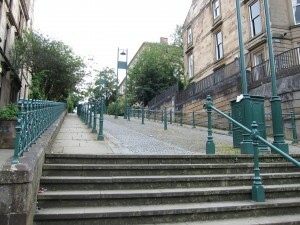 For the Scottish, a wee walk is about 5 miles (or an hour) straight uphill, often with a flight of stairs at the end. The ultimate take-home Scottish misnomer, and a constant refrain when asking for directions: "It's just a wee walk." 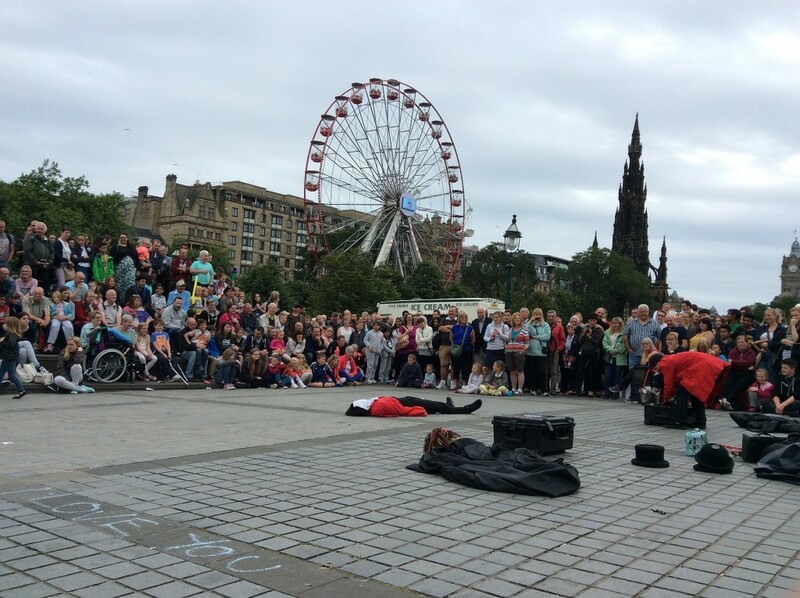 But no matter how you roll (like this crazy skateboarder in Edinburgh below), both cities are chock-full of amazing history and beautiful sights, great food and drink. 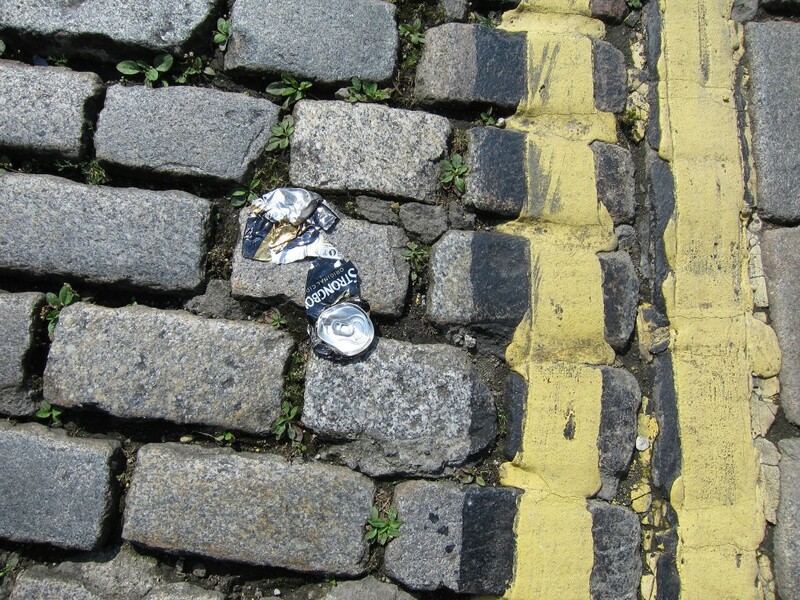 What follows are some of the highlights from my wee wobbles on the cobbles. 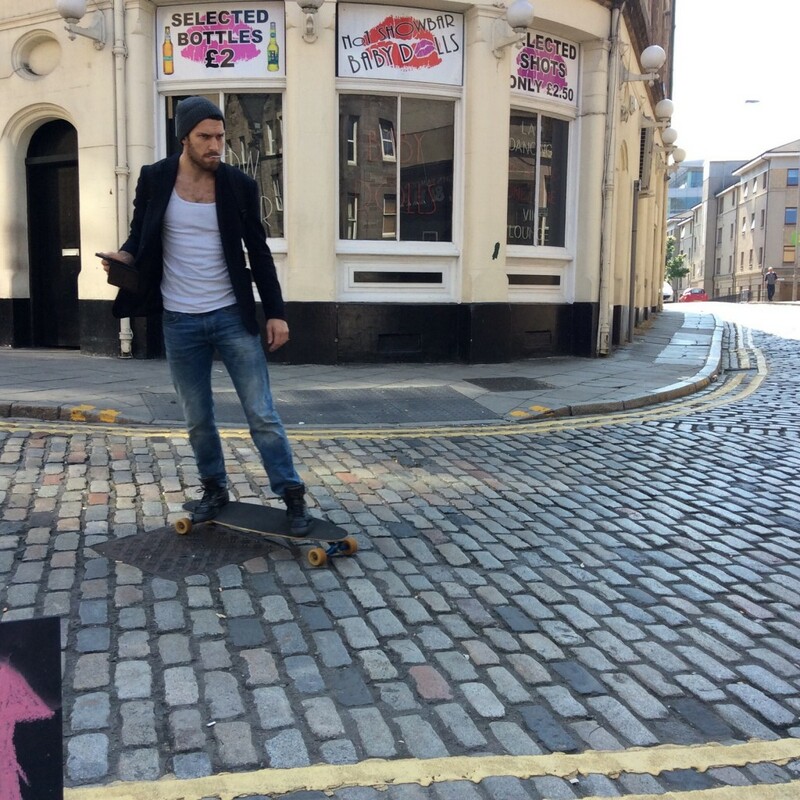 If you aren't already impressed by "Skate Gyllenhaal" get a closer look at the cobbles below. The cobbles, although picturesque, get very slippery when wet. I have a whole new respect for Tour de France participants after this trip. No wonder TdF announcer Phil Liggett is so emphatic when he describes how the cobbles rattle riders' eyeballs in their sockets. 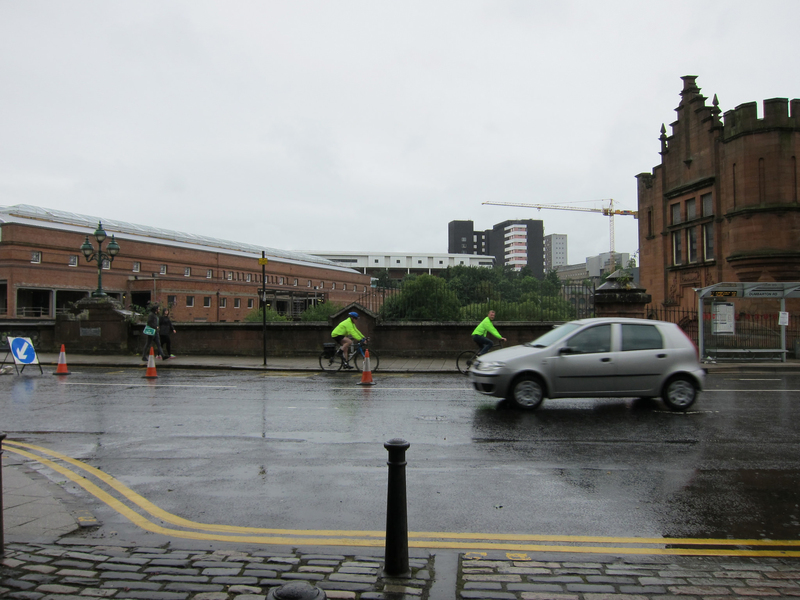 Cyclists were plentiful on Great Western Road in Glasgow, above. Glasgow was a more modern, working city and appeared to have more cyclists on the streets than Edinburgh. (To be fair though, I was in Edinburgh during the Fringe which probably made cycling more difficult.) 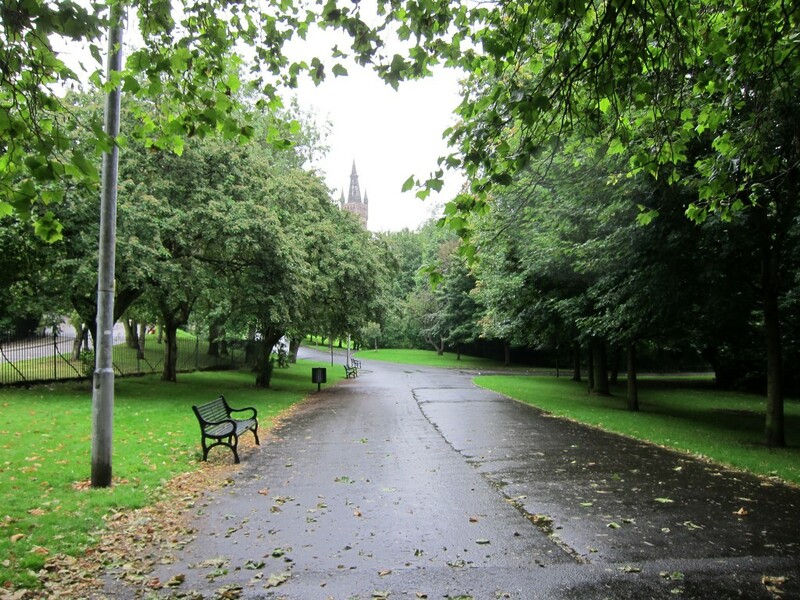 Glasgow has about 100,000 more souls than Ediburgh with a population of 600,000 (1.3 million in Greater Glasgow). 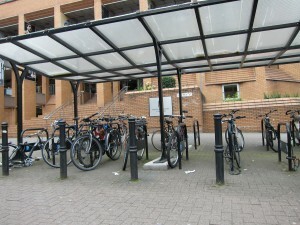 I noticed plenty of covered bike parking in Glasgow to protect bikes from frequent rain. Even better, "Twenty's Plenty" speed signs on many streets cautioned drivers to watch their speed in cities and towns all over Scotland. Toronto take heed: reducing speed limits is a proven effective way to reduce deaths on the road. 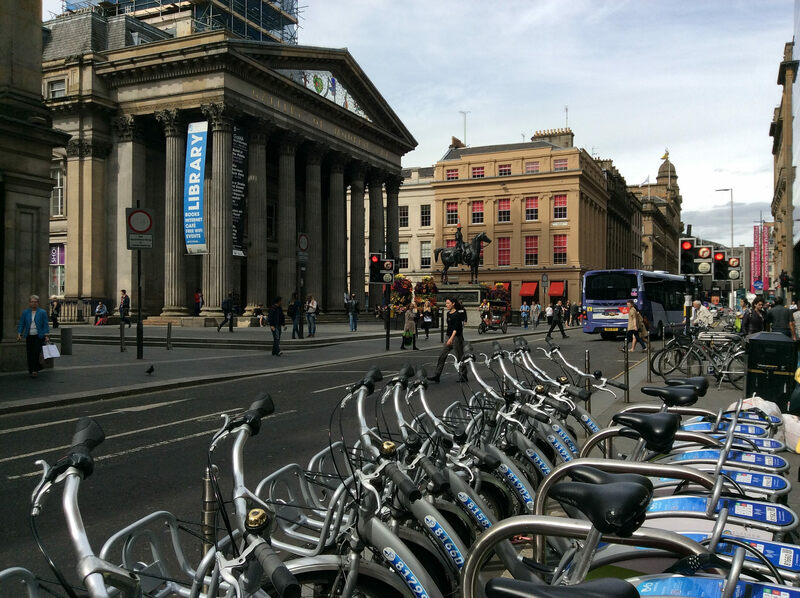 While in Glasgow, I was hoping to use the bike share system and rent a Nextbike, but I could not get any of the bikes to work. Apparently, they have't maintained their electrical system since the Commonwealth Games ended. After multiple efforts, I was able to get the code to work on one bike, only to discover I could not get the lock to open. I tried four different stations with no luck. I was immediately refunded and found myself wishing I'd brought along the loaner bike my friends had for me on our ride down Lady Mary's Walk. Even if they are not fully operational, bike share systems are an essential part of any great city's transportation system and are emblematic of a thriving bike culture. 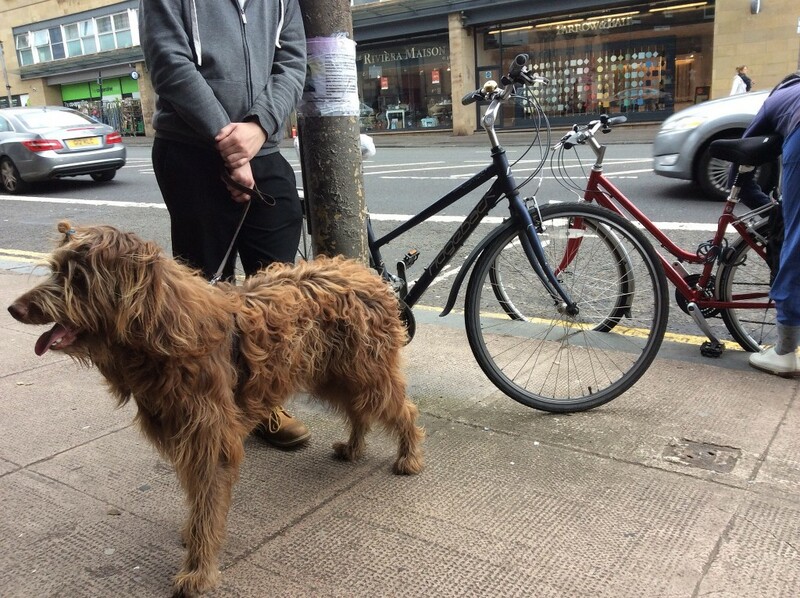 Dogs on bikes are also always a good sign that bike culture is deep and prevalent in your city. 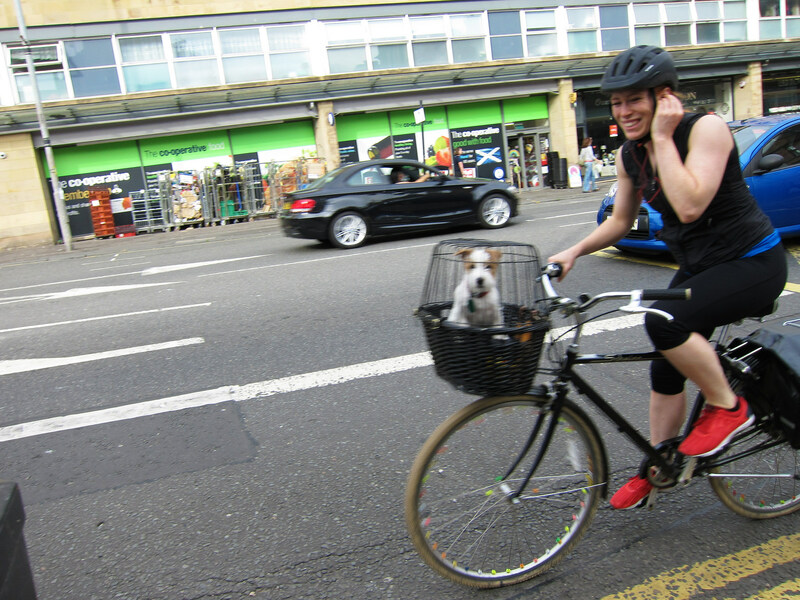 I saw this woman with her terrier in his customized basket a few times during my stay. 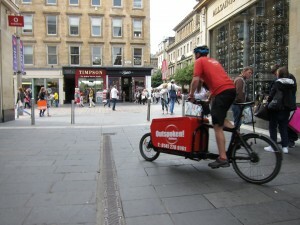 Cargo bikes are popular among Glaswegians businesses. 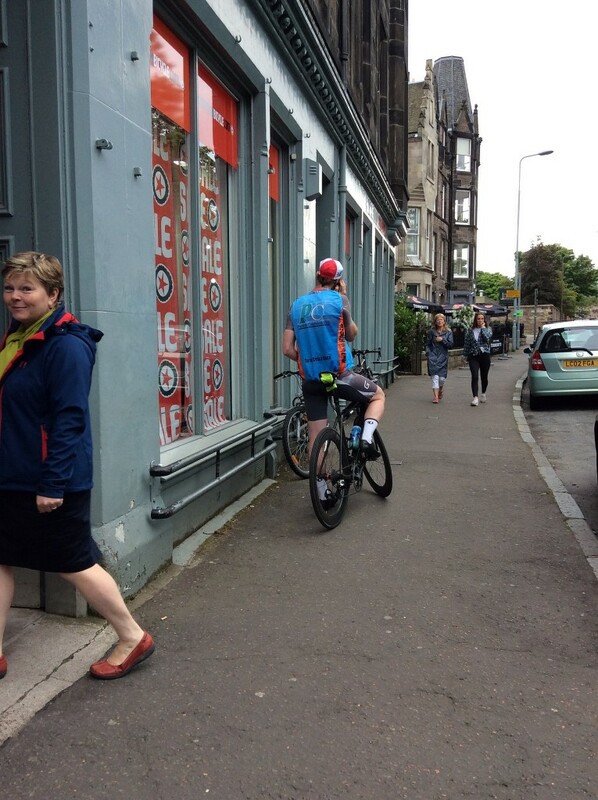 Bright clothing was a very popular choice for Scottish cyclists. 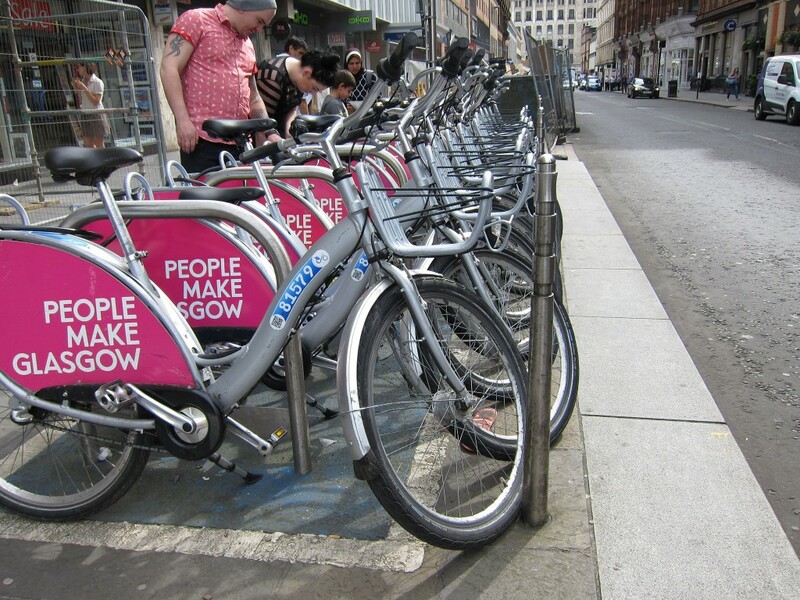 Although dogs on bikes and a sprawling bike share scheme are good sights in any city, there was one thing that stood out as a sure sign that Glasgow was a haven for city cyclists. 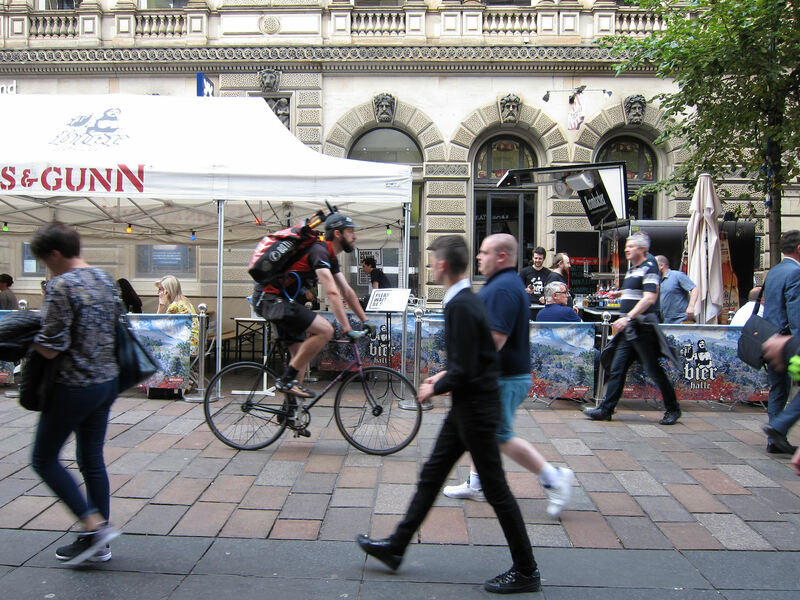 When there are bike paths through beer patios it's a sure sign that bikes are a prime part of the city's culture, and it was a delight to witness. 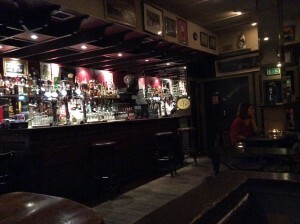 I quickly marked myself as a tourist, taking photos and raving about the unique location that welcomes both pints and pedalling. 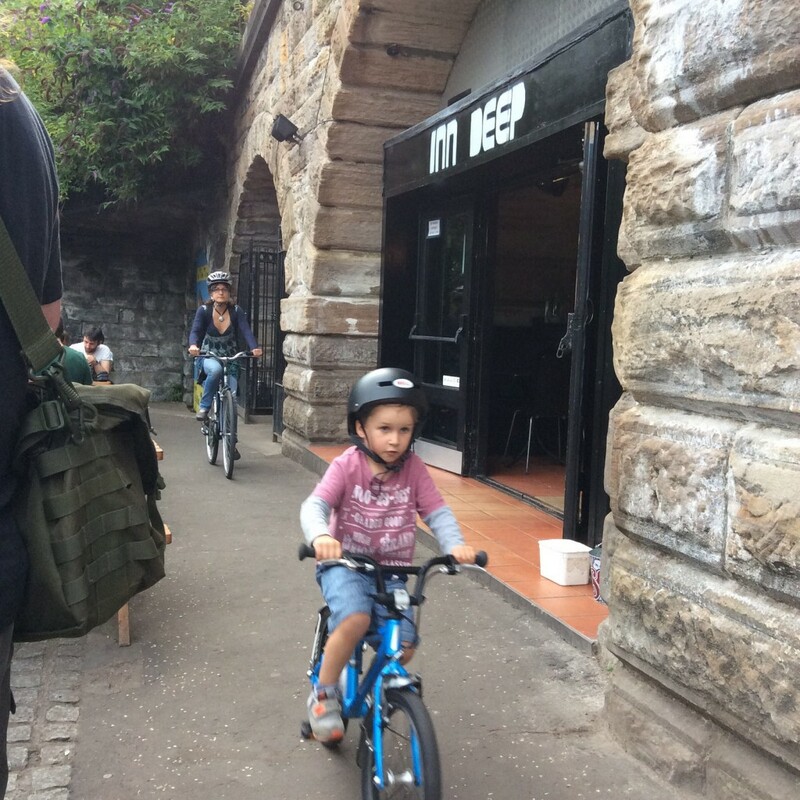 The pub was located on a winding bike path that follows the Kelvin River and provided the environment for a perfect pint: fresh air, great scenery, bikes, and freshly prepared food —all in one place! I had a mackerel salad and my pal Heather, a former dandy editor now living in Glasgow, had mixed chips. That was one of the greatest things about Scotland: pubs with decent, locally-sourced food. Brews and scenic river views. 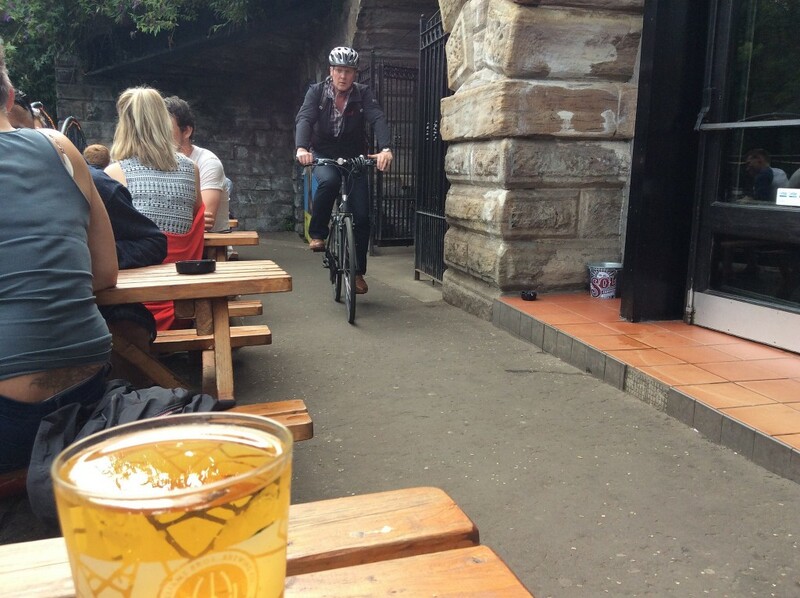 If something like this bike-path-through-a-beer-patio existed in Toronto there would likely be a Facebook page dedicated to complaining about it. 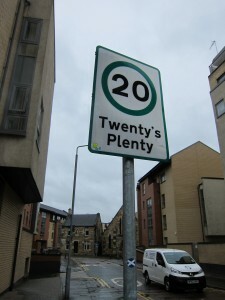 Instead, in Glasgow, a bit of chalk simply saying "No drinks beyond here" keeps the peace. 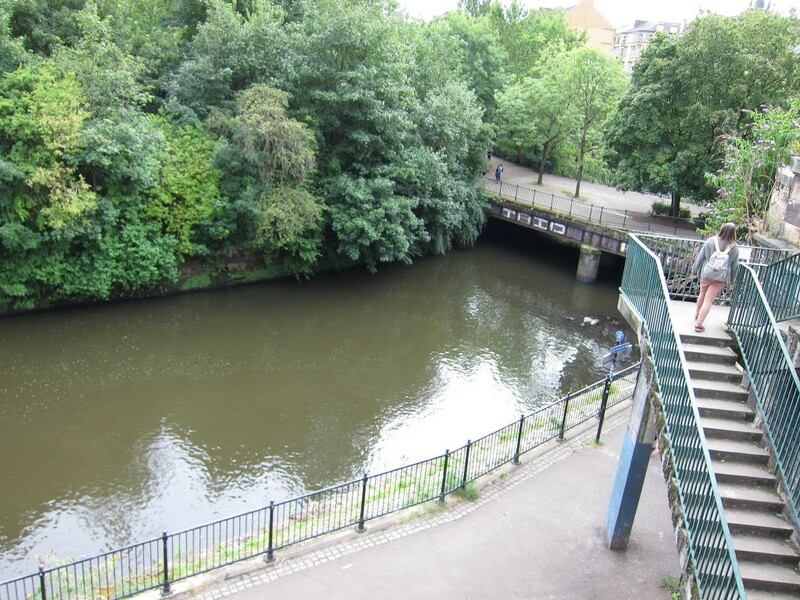 One of the more beautiful wee walks during my trip was along the River Kelvin to Maryhill Road and the west-end neighbourhood where dandy Heather lives. Being on an island that teems with rich history, you come across interesting relics all the time. 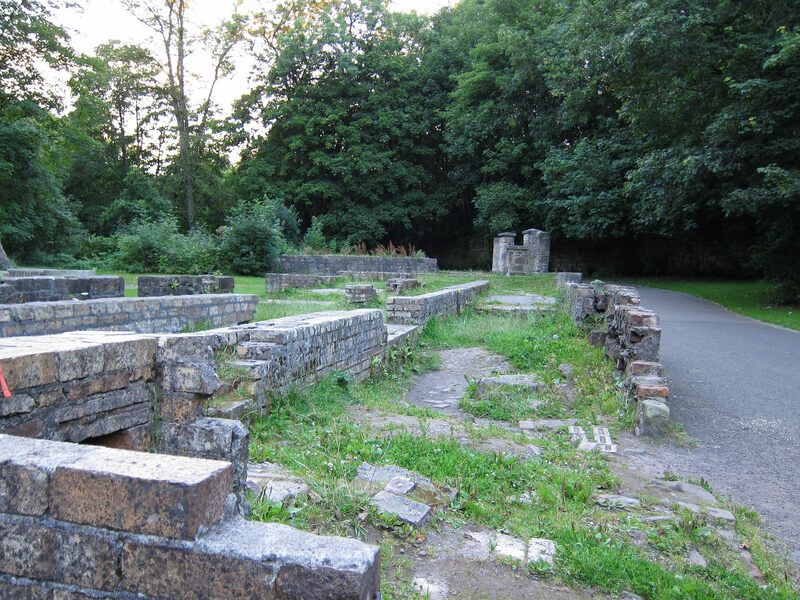 This (above) is what remains of the North Woodside Flint Mill on the river. It was built in 1765, and was used to grind gunpowder during the Napoleonic Wars. 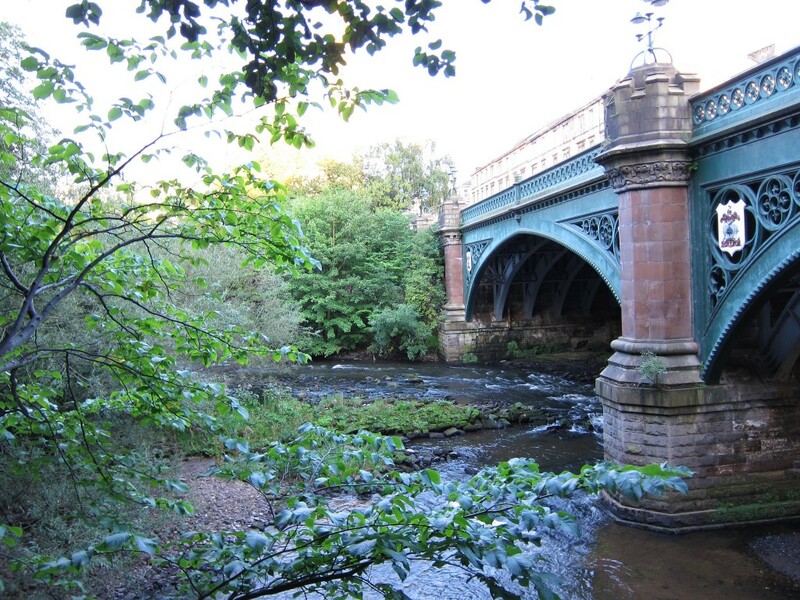 It's within the boundaries of the Glasgow Botanic Gardens. 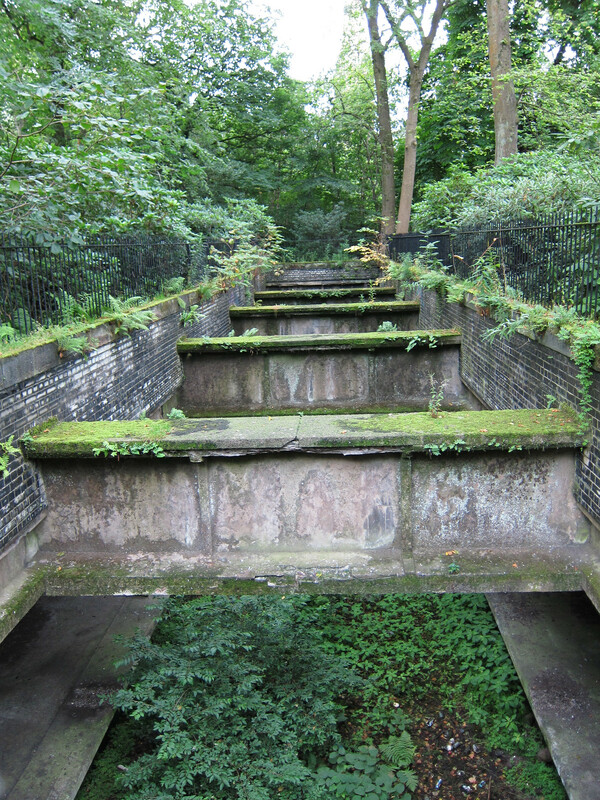 Some of the relics weren't quite as old as others, I saw the remnants of the former subway (above) also within the Botanic Gardens. Little reminders of the city's past were everywhere. The current subway wasn't the best way to explore, since it covered only a small oval of the city. In Scotland, the bus, subway and train systems are all privately owned and don't connect with each other, making transit transfers somewhat inconvenient and definitely more costly than a wee walk. 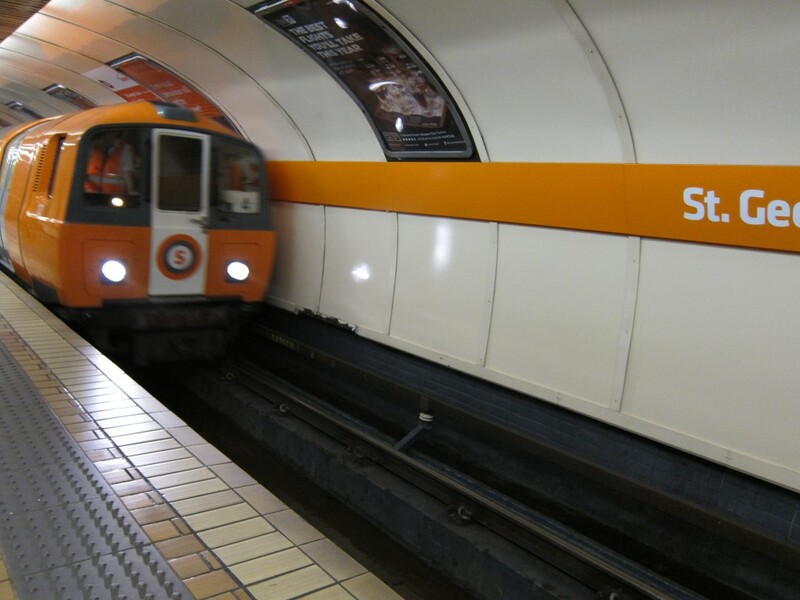 The orange tube that is the Glasgow underground has a very '70s vibe. Tall people need to duck down when entering. 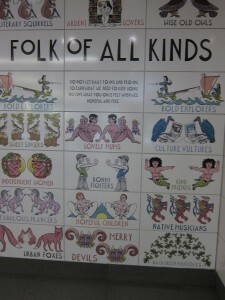 The subway also featured some pretty adorable murals. "Do not let daily to-ing and fro-ing, to earn what we need to keep going, prevent what you once felt when wee - hopeful and free," is what this mural says under "Folks of all kinds." 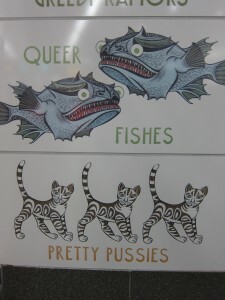 "Queer fishes" and "pretty pussies" made me laugh out loud. I think I might be more of a "literary squirrel." 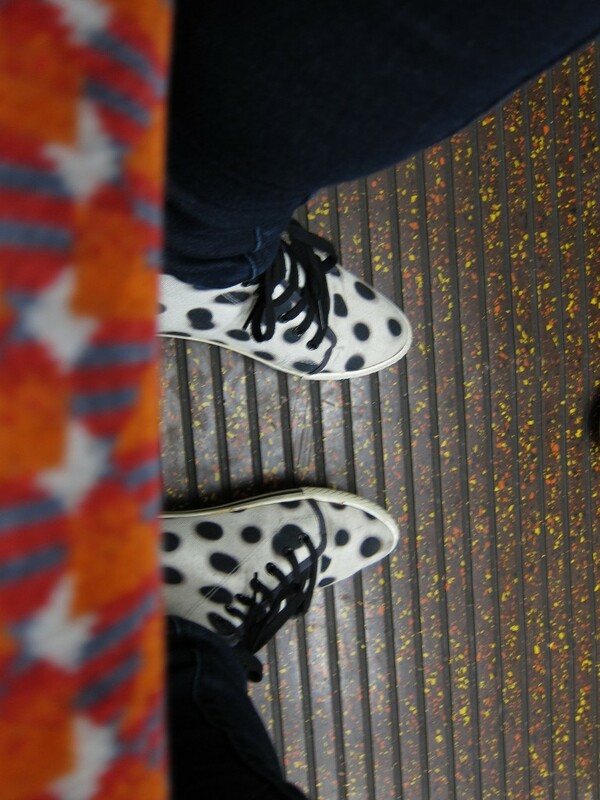 The seat fabric and flooring on the Glasgow underground was reminscent of 70s design... and clashed with my shoes. The messenger-looking cyclist above appeared to be checking in on the bike share bikes (making sure that the tires were full of air) as well as some of the street people who ask for money. Perhaps this chap is with "Glasgow Bike Station" - an organization committed to advocating mental and physical health through cycling as a means of transport that won the contract to carry out all bike maintenance for the Commonwealth Games. 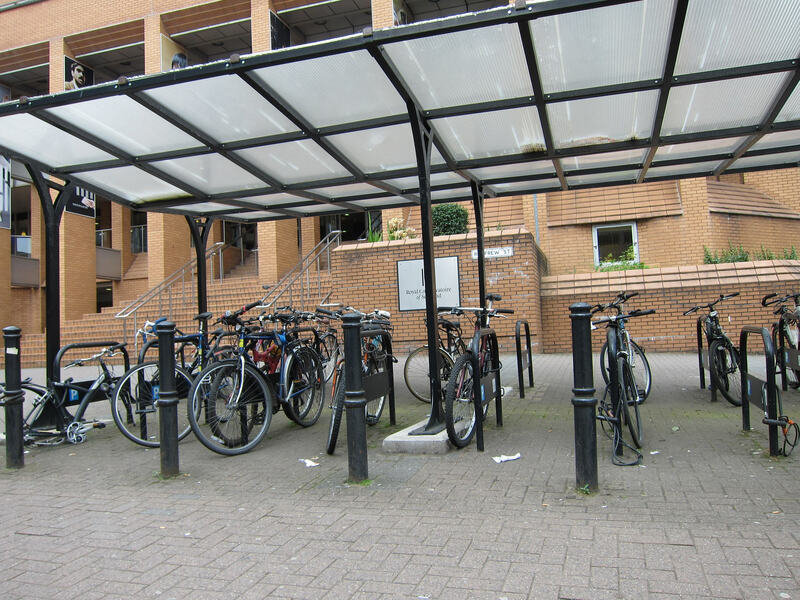 There's no indication of this on their website though, which might explain why the bikes aren't really maintained. Maintaining the bikes' mechanicals is moot if the electronic systems don't work. Although it would have been great to take the city in on two wheels, there were lots of things I might not have seen along the way if I hadn't been walking. Like this dog with a top-knot. Street style in Scotland was interesting. I spotted some fun tartans and, naturally, good shoes. 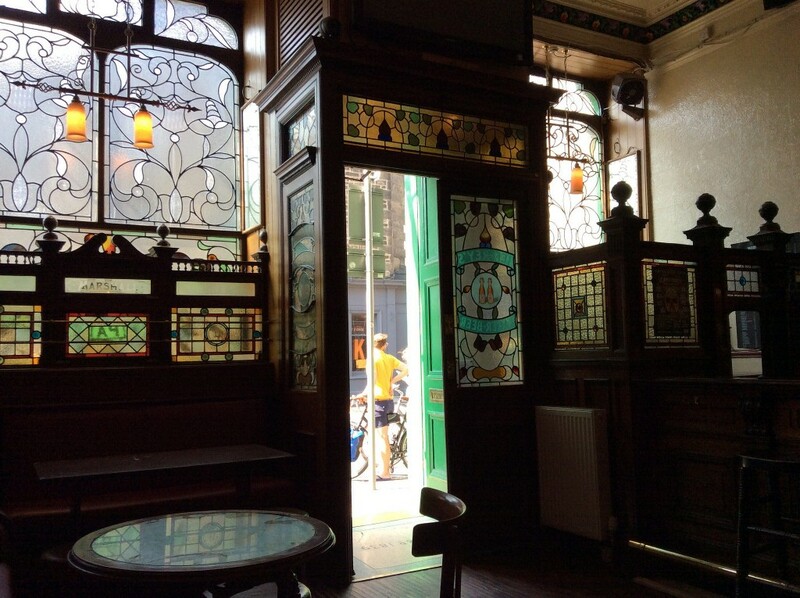 The Bell pub was one of the great things about Great Western Road. The side street next to The Bell was lined with high bells. The mighty Kelpies are magnificent horse head sculptures found along highways in Scotland. The Kelpies are the largest equine sculptures in the world. Kelpie is the name Scots give to a shape-shifting water spirit that is supposed to inhabit the lochs and pools of Scotland. 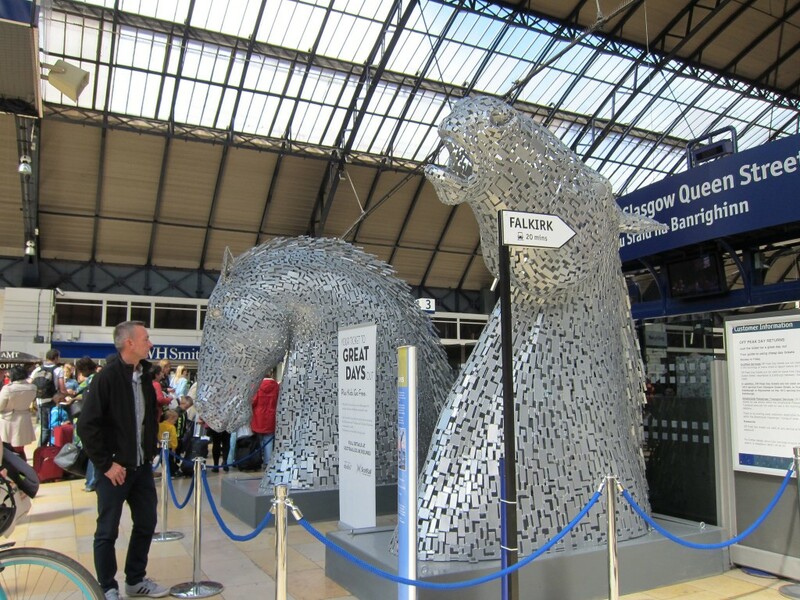 These smaller versions are on display at the train station downtown in Glasgow. Talk about dandy horses! The Kelpies were not as prevalent as the pipers though. 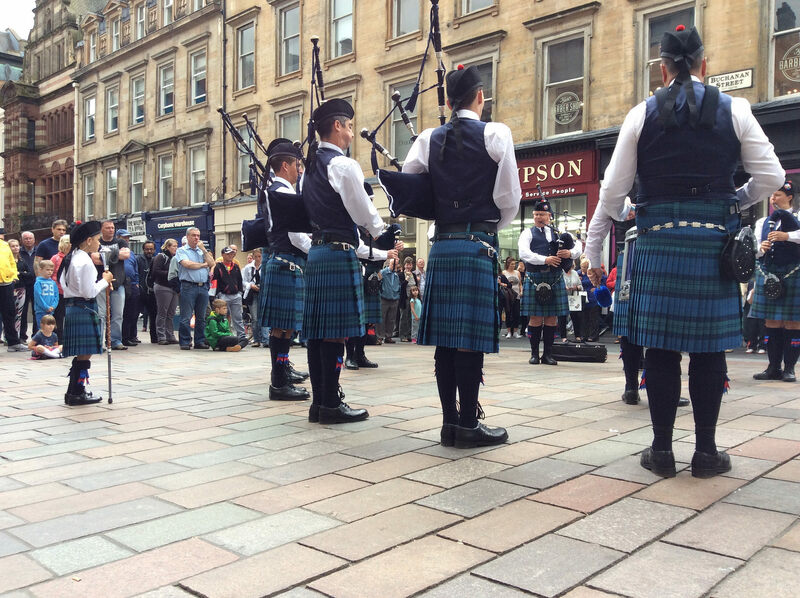 My hosts told me there were more pipers on the streets than usual because my visit coincided with the International Piping competition. Fair enough. These particular pipers were from Sweden. 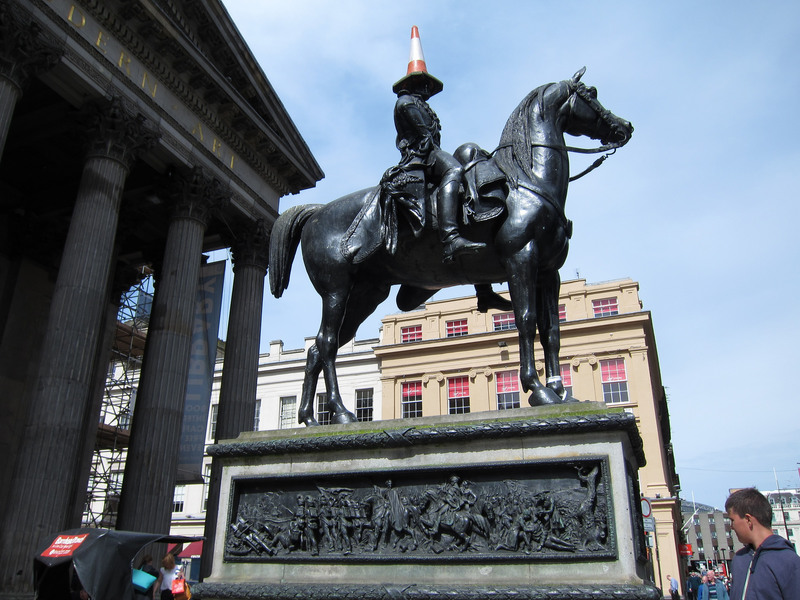 I stopped by the Glasgow Museum of Modern Art (GoMA) and saw the famous cone-hatted statue of the Duke of Wellington out front. The cone's been placed there by hooligans and subsequently removed by the museum over and over again since at least the early '80s. In 2013, GoMA planned to add height to the statue to stop the shenanigans, but the locals petitioned. The museum conceded and now the pylon is set to stay and makes the statue a popular-to-photograph landmark downtown. 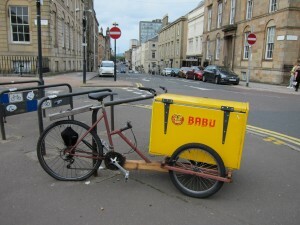 There is a rickshaw that circles the museum and the downtown core most days. There's even a photo of him in the trike display at the Riverside Transport Museum. 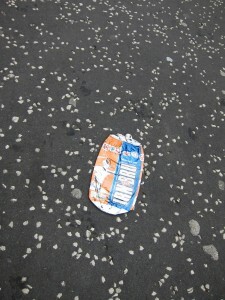 Walking allowed me to really notice the details of the city, like this completely flattened can of the nation's (non-alcoholic) drink, "Iron Bru" as I was leaving the flat one morning. 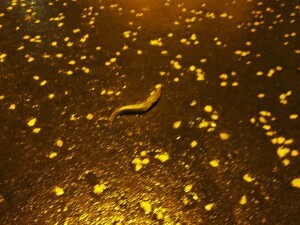 I also came across this slug (along with dozens of others just like it), as I was returning to the flat at night. It's almost as big as an Iron Bru tin! In Scotland, the slugs are so large and populous that they constitute a serious slipping hazard. Of course, I would never have had such an intimate experience with the slugs if I hadn't been walking. Nothing against the slugs, but I wanted to ride. 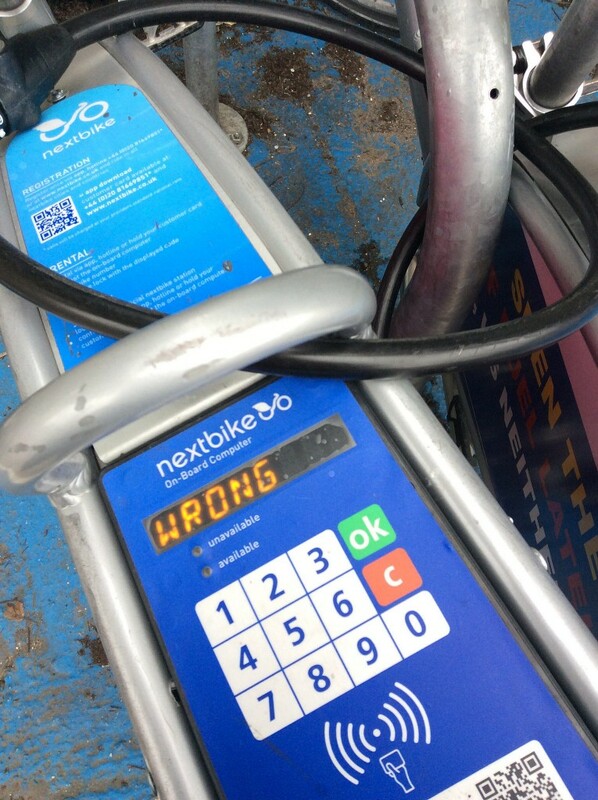 I tried again (and again), determined to free one of these Nextbikes, but I continued to struggle. A kind woman just closing up her snack hut next to one bike station took pity on me and asked if she could help. She called the support line, which wasn't working, and then offered to give me a ride, as it was raining. I was so happy for the offer. But when I told her where I was headed, I should have expected her response: "Oh, it's just a wee walk!" She pointed to one of the spires in the distance. "It's just by that steeple." There were about five steeples in view. And so I was off again for a wee walk in the rain, like a true Scot. And I can see why they do it, walking is a wonderful low impact exercise that allows you to see and interact with the city much differently than you would on bike or in a car. One of my favourite wee walks was from the Riverside Transport Museum through the Kelvinbridge park (above) back downtown for dinner. 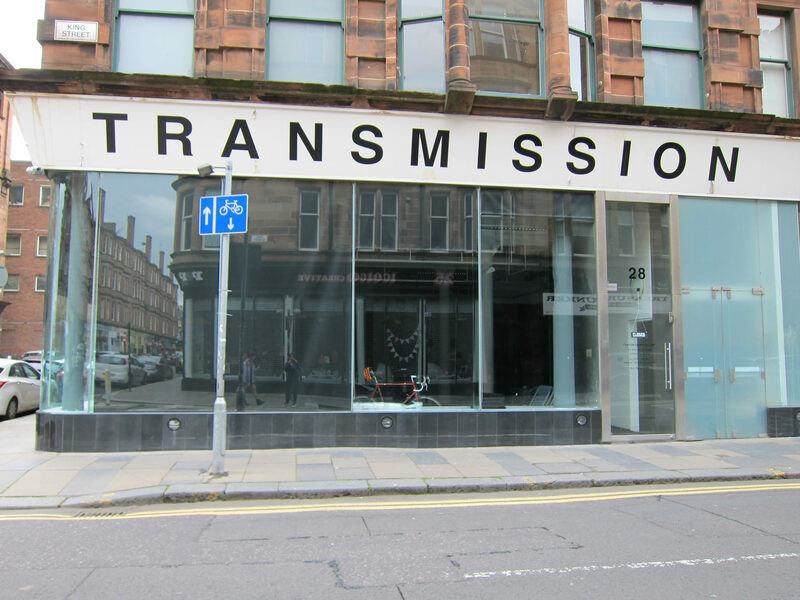 I passed by Transmission gallery, made famous by Franz Ferdenand in the song Do You Want To. 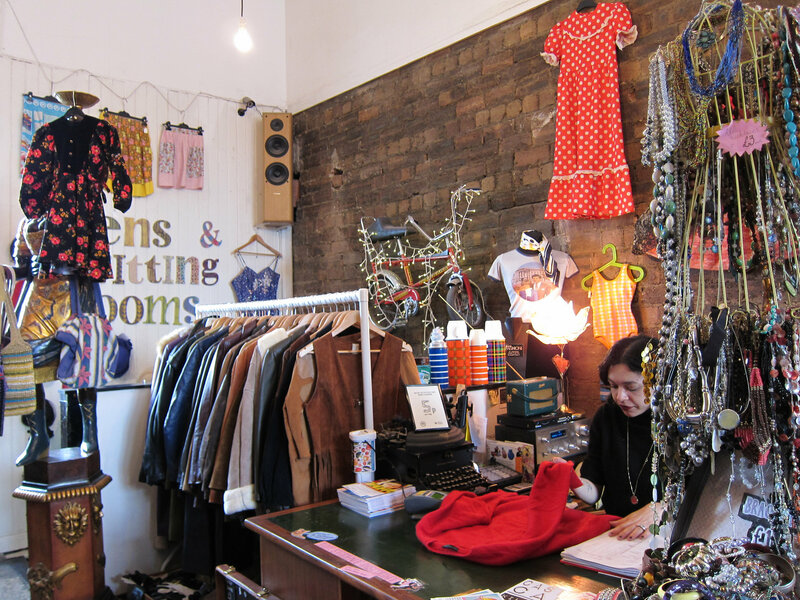 I also discovered some pretty sweet vintage shops during my wee walks. 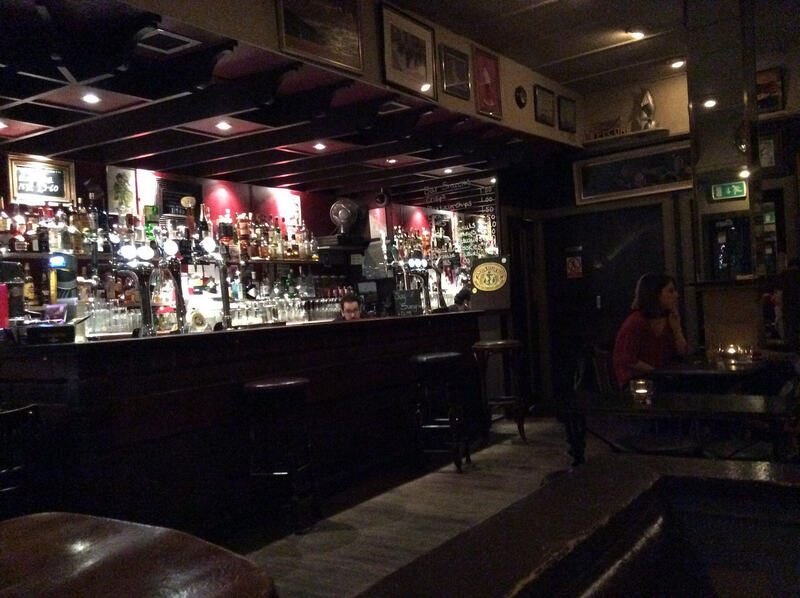 Another highlight in Glasgow was a fun night out at a bar called "Nice and Sleazy" known as "Sleazy's" where Heather used to work, on Sauchiehall. I picked up some of the vernacular, so I could identify the "lads" getting drunk and the subsequent "bobbies" keeping them in order (without tasers or guns - note to Toronto police). I also learned about "Neds." In a mildly amusing moment, upon hearing my accent one spray-tanned "Nedette" came teetering over and loudly asked: "Are you from New York? I LOVE NEW YORK." She was visibly disappointed when I told her I'm from Toronto and that, no, I didn't have a smoke she could knick. 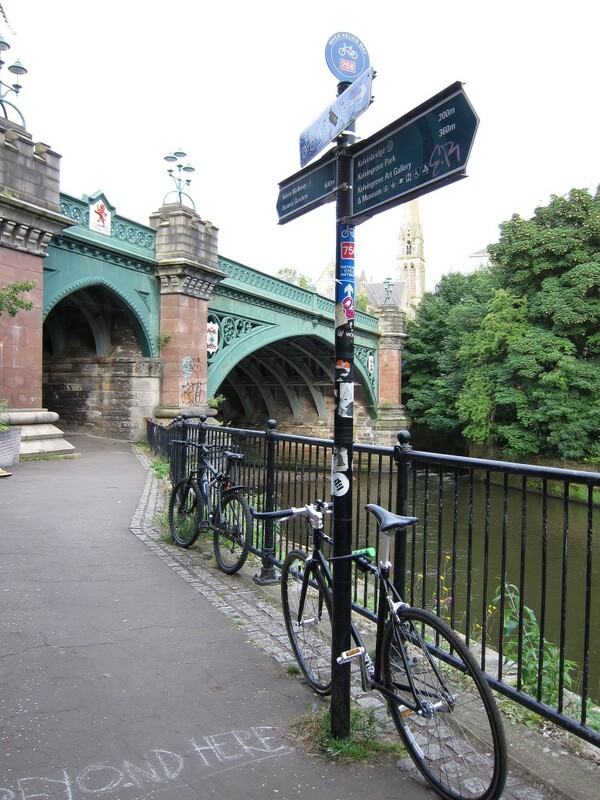 If Glasgow was a more modern cycle-friendly city, then Edinburgh - Scotland's capital - did a better job of showcasing it's historic gems, and really demands those sights and sounds be taken in via a wee wobble on the cobbles. 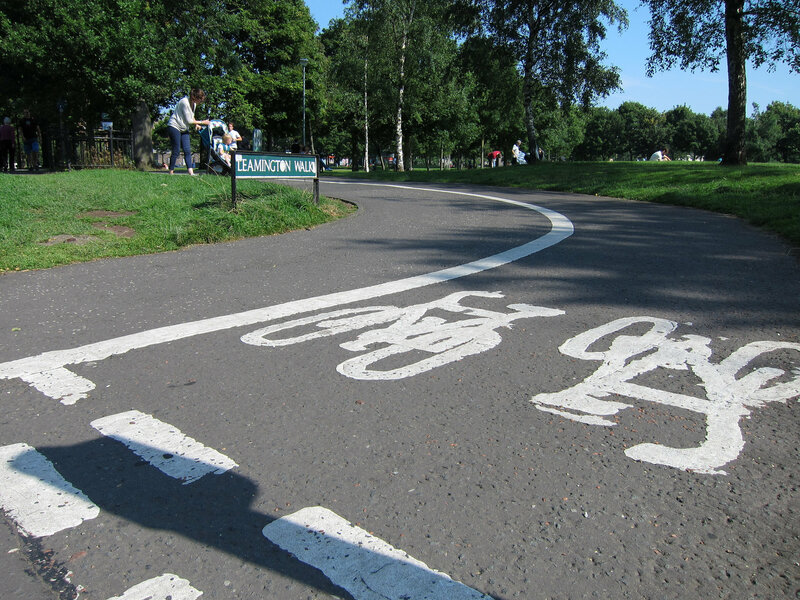 Edinburgh had lots of signs of a thriving bike community and some infrastructure too... like this smooth bike path through the Meadows below. Fiona (my host from Crieff) showed me the Bicycle Cooperative (which reminded me very much of the Canadian chain, Mountain Equipment Co-op) on the way through The Links - a large golf course right in the middle of town, adjacent to the Meadows - to partake in The Fringe, the worlds largest arts festival. 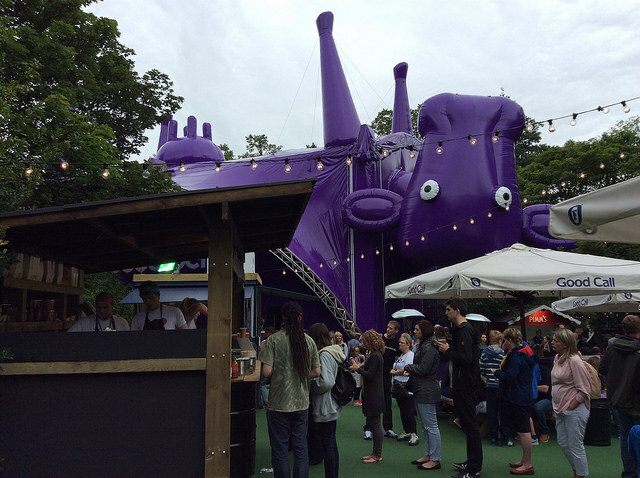 At the Fringe festival, I enjoyed a drink under this giant inflatable upsidedown purple cow, or "coo" as the Scots say. We had some curry with our drinks and met a couple of local lads who were already a few pints in. We told them we were on our way to the tattoo that night. They told us about the highlight, near the end, when the old war plane flies low overhead right before the loan piper plays from atop the castle. "It'll give you shivers up your spine." Although Fiona was dubious as to whether it was a real plane or a sound effect, it was too foggy for us to see above either way. 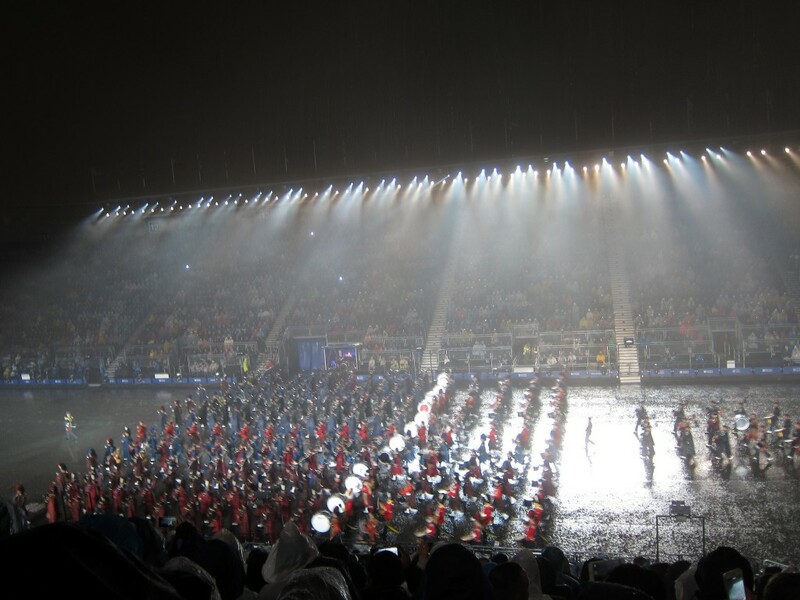 The only day it *really* rained was the day we went to the Royal Edinburgh Tattoo, which is held outside. This photo above is blurry because I had to take it from under a plastic poncho during a torrential downpour. I was nostalgic for the great weather we had had for the Crieff Highland Gathering earlier in my trip. After so much walking I was yearning for my bicycle. But during my final days in Scotland, while in Edinburgh, I really yearned for someone to give us a ride back to the flat. But even the rickshaw drivers declined when I asked —nay, begged— them to ride us back to our AirBnB. I would have paid anything. 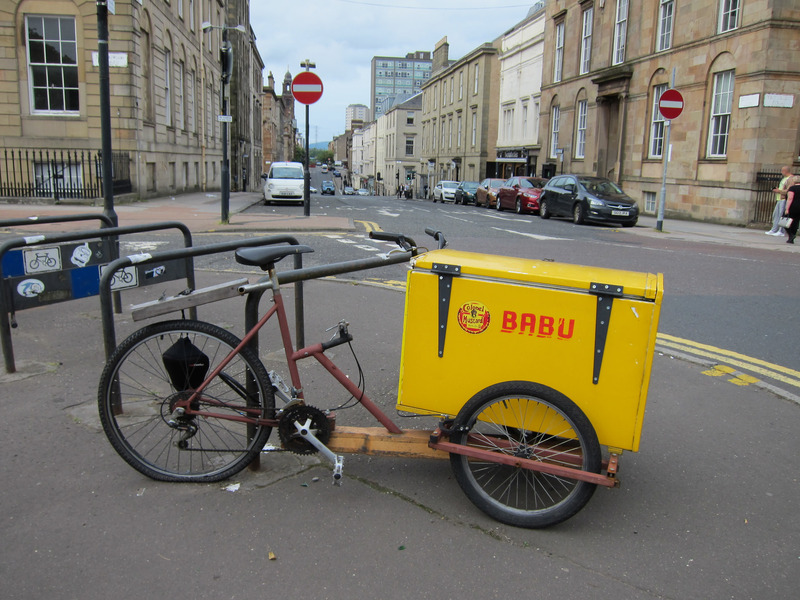 But even with my offer to pay double, the rickshaw driver said: "Oh no that's way too far and there's a big hill." Trying to encourage me, my friend said, "It's just a wee walk." After ten days though, my dogs were barking, my shins were splint, my arches were flat and my achilles tendon was becoming my achilles heel. In my heart I wanted to walk more, but my body (especially from the waste down) was saying "let's stop for a lagertop." Bennett's pub in Edinburgh may not be as famous at The Golf pub on The Links, but it had these excellent tables, and gorgeous stained glass windows. I enjoyed a lager topped with a bit of lemonade -- aka a lagertop. 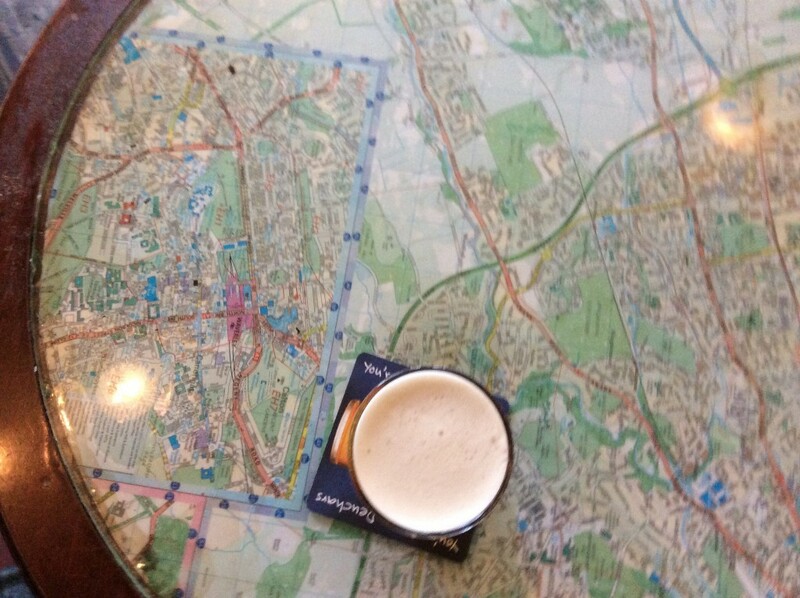 And nothing beats the satisfaction of a pint after a wee walk. From seeing oldest working bicycle in the world to my first grasstrack race ever to riding along historic Lady Mary's Walk my bike experiences were indeed dandy... but truly, Scotland is a country of walkers. And, truth be told, I missed my bicycle.